Enter your mobile phone number or text JOIN to 55753. 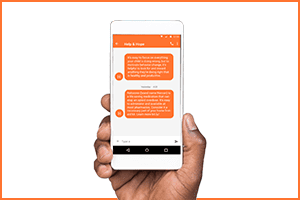 Text CHAT at any time to speak directly with a Parent Helpline Specialist. Life-Saving Information: Learn how to guard against and respond to overdose. Strategies to Help Motivate Your Child: Understand the benefits and concerns of different treatment options for opioid disorder. Reminders to Take Care of Yourself: Get tips on how to better take care of yourself in order to help your child. Live Support: Connect live with our Helpline Specialists to ask questions and receive additional support. Don’t forget that you’re your child’s best advocate. We’re here to be yours. I’m not sure if my question went through…it’s asking me to leave a comment. Would this text/help center be able to help a family that is in the emergency room with their loved one that is on the Vivitrol shot–to tell the family what kind of pain medication is safe for the person that has been in an accident, when the medical staff doesn’t seem to know anything about the Vivitrol shots. Thanks for your question. For the most part, this resource is to provide day-to-day support and is not meant to be used in crisis/emergency situations. The article suggests that any person using Vivitrol should carry a wallet card or wear a bracelet identifying the use of the medication. “In the event that you need medical treatment, be sure to tell your healthcare provider that you are receiving VIVITROL treatment and the date of your last injection. This is important because VIVITROL can also block the effects of opioid-containing medicines that might be necessary to block pain in an emergency.